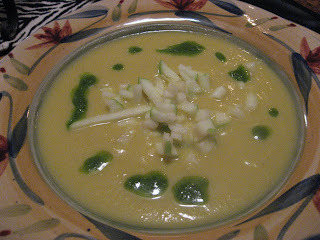 The author of "The Conscious Cook Book" was on Oprah the other day, cooking this soup. It looked simple and elegant, so I gave it a try and I am so glad I did. This is a FIVE STAR soup!! It is spectacular! A great soup to make when you want to impress your guests! It looks pretty, it tastes great and it's fairly easy to make. I was so full after 2 bowls that I could not eat anything else for dinner. I don't have a high speed blender,so I had to take a few extra steps, but this soup is worth any work you put into it!! Who would have thought that you could take something so ugly, and create something so pretty? THIS is celery root! 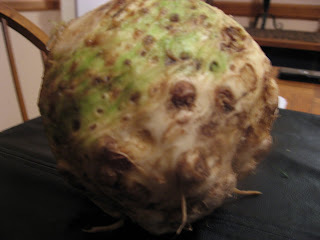 In my 53 years, I have never used celery root - until now. If you eat cooked food - I HIGHLY recommend this one. The only recipe change I made was to the Chive Oil (do not leave it out!). I used raw chives and did not cook them. I chopped them and put them in a nut grinder along with the olive oil. Make it enough in advance to let oil become infused with the wonderful flavor. Also, be sure to cut the granny smith apples in very fine slices. WOW! These really compliment the creamy soup flavor. This is one of my all time favorite soup recipes.